Obituary for David Nathaniel Hoyle | Doolittle Funeral Service, Inc.
David Nathaniel Hoyle passed away on April 1, 2019, beloved husband of Nicole (Dreier) Hoyle, son of Benjamin and Karen (Shetzline) Hoyle, brother to Jonathan (Blair Wagenblast), and Julia (Kelby Russell), uncle to Theo Hoyle and Julia Dreier. David was the second child of Karen and Ben and was born on August 13, 1985. He was a 2003 “half lifer” graduate of Abington Friends School and was a member of 2002 Friends School League championship soccer team. At AFS David developed his love of art and balanced this with his love of physical activity. David’s deep Quaker roots helped to establish in him his commitment to honesty, integrity, and love of life, all characteristics that shone through in his everyday interaction with anyone he met. As described by a friend, “a role model, a leader, a teammate, and most importantly a friend. All ways I would describe Dave Hoyle. His constant smile and never ending love for others astounded me. He has made the world a better place.” David is a 2007 graduate of Hobart and William Smith Colleges, where he majored in studio art with a concentration in woodcut prints. While there, he began his lifelong passion for cycling guided by his Uncle Fred Hoyle. After graduation, David headed to Connecticut to join a cycling development program, Target Training. Later David joined the CCNS team and the Connecticut Cycling Advancement Program (CCAP), where he was Executive Director. Under David’s leadership CCAP reached out to young boys and girls at a grassroots and community level to help them become involved in a variety of cycling activities and events. CCAP was named by USA Cycling, the official organization for competitive cycling in the U.S., as the top cycling club in the country for 2016 and 2017. Upon receiving this award, David stated, “Every kid has a road in front of their house or woods in their backyard to ride, and we’re lucky that Connecticut as a state is one of the most beautiful places to ride.” CCAP also hosted several major cycling events under David’s leadership, including the 2018 Cyclocross National Championships and the annual New Haven Grand Prix. 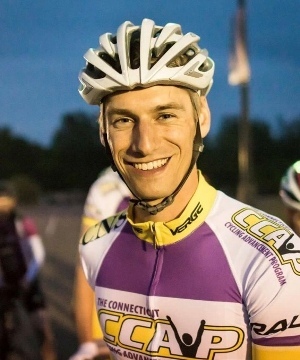 After the 2012 tragedy in Newtown, CT, David partnered with other cyclists to form Team 26, which annually has ridden from Newtown to Washington, D.C. to raise awareness of gun violence and to advocate for reasonable legislation. Celebration of Life will be held on April 13, 2019 at The Riverhouse at Goodspeed Station, 55 Bridge Street, Haddam, CT 06438, with visitation from 9:00 am to 10:30 am and a time of remembrance at 10:30 am. The family requests donations to CCAP, Breakaway Benefit, 353 Main St., Middletown, CT 06457. To share memories or send condolences to the family, please visit www.doolittlefuneralservice.com.